How do I set my i-SENSYS MF-5980dw machine to save toner? How do I save Canon MF-5980dw toner? A compact all-in-one laser printer, the Canon i-SENSYS MF-5980dw gives users the power to print high-quality documents and graphics from anywhere in the room with its wireless networking capability. The i-SENSYS MF 5980dw multifunction printer offers good functionality and is highly energy efficient, keeping costs down not only in toner consumption but in power consumption as well. The Canon i-SENSYS MF-5980dw printer is capable of duplex printing, not compromising its printing average, which is rated at 33 ppm. It can copy, scan, and fax, although it can only produce monochrome prints, which can be a set back for offices in need of a powerful colour printer. The Canon i-SENSYS MF-5980dw printer is compact enough to fit any desk space, measuring only 390x473x431 mm. The unit does not weigh much at only 19.1 kg, considering its additional features like the auto duplexer, ADF, and high-capacity paper cassette. It features an intuitive control panel, which makes operation user-friendly, and connectivity is possible through the Ethernet and WiFi ports, and direct USB slot for flash drives. The i-SENSYS MF-5980dw has an energy-efficient design, cutting costs when it comes to power consumption. Wireless connectivity makes the Canon i-SENSYS MF5980dw laser multifunction printer an ideal choice for any workgroup setting. 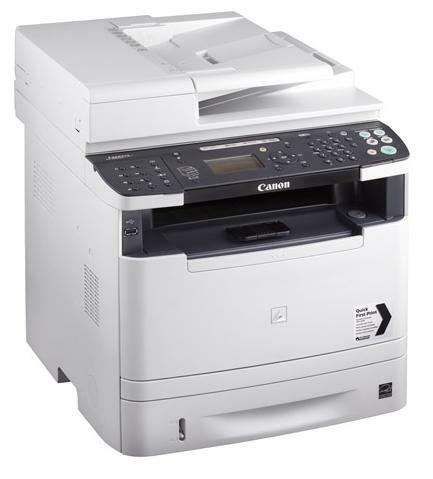 The Canon MF5980dw is network-ready and increases productivity with its quick printing rates. Other features include scanning to email, USB memory key, and network folders, along with double sided printing and copying, and quick fax. An optional cassette for expanding paper capacity to 800 pages allows more productivity. Inability to print in colour is the only real disadvantage for the Canon i-SENSYS MF-5980dw mono laser printer. Capable only of monochrome printing and copying, the MF-5980dw printer model can be limiting to offices with plenty of colour printing needs.